One loss hurt the Maroons more than any other this season. That loss came on Thursday against #21 Case (14–7) in the first round of the UAA Championships. Chicago plays Rochester in the consolation semifinals today at 8 a.m.
With #30 Chicago (9–9) already having eight losses on the season prior to the Championships, only a solid finish would likely result in a hopeful NCAA National Tournament bid. But, the Spartans did not allow that to happen. After fourth-years Jan Stefanski and Troy Brinker at No. 1 doubles lost 8–3, first-years Ankur Bhargava and Deepak Sabada tied the match with an 8–6 victory at No. 2. Second-years Zsolt Szabo and Krishna Ravella at No. 3 would determine which team had the momentum going into singles. After losing to the same pair just two weeks earlier (8–4), the Maroon team had a rejuvenated mentality to win. Although the Maroons were down an early break at 1­­­–3, they quickly recovered to put the match on serve at 2–3. That mini-comeback gave what Szabo calls extra momentum, and Chicago broke the Spartans to make the score 4–3. Unfortunately for the Maroons, the momentum did not stick. Chicago was down 7–8 but, with hard and accurate groundstrokes, sent the match to a tiebreaker. 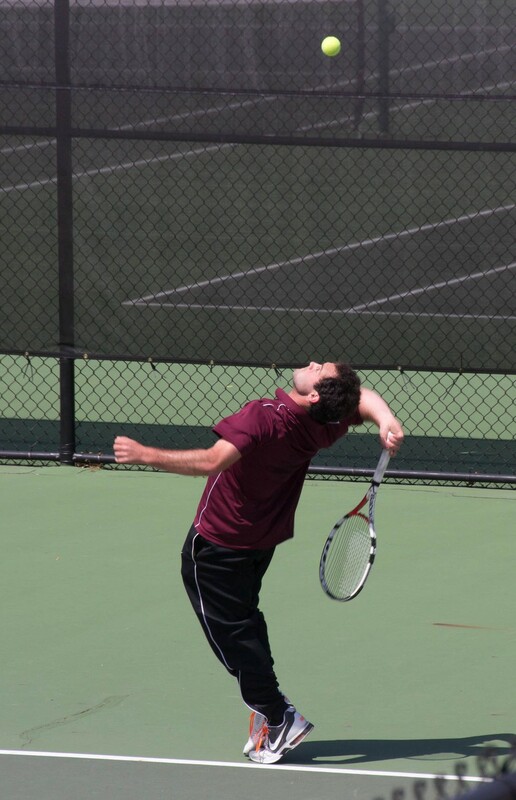 In the tiebreak, the Maroons overcame a 0–3 deficit to go up 5–4 with Szabo, the pair’s better server, up to serve. While Szabo’s serves went in, a missed volley and groundstroke put the Maroons down 5–6: match point for Case on serve. Three points later, Chicago was bested by Case (9–8 (6)). In spite of being down 2–1 after doubles, the Maroons were not at all demoralized going into singles. The last time Chicago encountered Case, the Spartans did not allow any doubles matches to go in the Maroons’ favor. The extra boost was not enough to give Chicago the four singles wins needed to clinch the match. Losses to Brinker at No. 1 singles (6–1, 7–6 (9–7)) and Sabada at No. 6 singles (7–5, 6–1) put the Maroons down 4–1. A loss to Stefanski at No. 3 (6–1, 4–6, 6–2) the same time Szabo won at No. 5 (7–6 (4), 6–3) clinched the win for the Spartans. Shortly afterward, second-year Alex Golovin was victorious (7–6 (10–8), 6–4) at No. 4 and Bhargava lost (3–6, 6–3, 6–2) at No. 2. If Chicago defeats Rochester, it will play in the fifth-place match at 4 p.m. today. If the Maroons lose, they will play in the seventh-place match at the same time.